There’s little wonder that mobile apps are fast becoming an integral part of the common man’s life. With the time spent on mobile apps by people across the globe increasing continuously, a heavy demand is being felt for Mobile App Development Companies. This is more so in the case of the Indian sub-continent. India has been rated as the world’s third largest mobile app user. There’s no end in sight for the number of mobile apps being developed and marketed in the modern world. With several new apps hitting the cyberspace, the revenue generated by the mobile app development industry is expected to skyrocket too. The rapidly growing mobile app usage in domestic as well as international arena and the constant demand for reliable and efficient mobile application development by world nations has certainly created a big boom among professional mobile app developers in India. It has become very common for individuals and professionals to make use of their smartphones to perform their everyday activities. With almost any function being possible to be conducted online using mobile devices, an obvious thirst for mobile apps among mobile users in India as well as other nations is being felt clearly. India has attained the position of being the fastest-growing mobile app development market in the modern world, thanks to the rapid increase in mobile app usage. Regardless of whether it is Android or iOS, The Indian mobile app market witnesses the maximum number of app downloads. From connecting and communicating with friends through making high-value business transactions, there’s little that cannot be achieved by using mobile apps today. Mobile apps are being used for conducting several useful functions such as paying bills online, booking tickets and accommodation, selling or purchasing products and services, making fund transfers, and much more – all in a secure and convenient manner. Supporting factors such as a competitive and growing mobile market, the availability of reliable talent in mobile app development, and the increasing mobile device penetration augur well for the current mobile app development revolution in India. Consumer requirements and preferences as well as the modern individual’s tastes have been acting as a boost for mobile app development in India, especially for banking, wallets, and groceries, among other things. Recently achieved 4G networks have exacerbated the use of mobile apps as millions of mobile device users, especially smartphones, have found carrying out their online transactions to be hassle-free and quick, when they use mobile apps. All elements appearing to fall into place, India is certainly on the way to become the global leader when it comes to mobile app usage and mobile app development in the coming years. Affordable smartphones, improving Internet connectivity, and increasing mobile device-using population are a few of the factors that support the growth of mobile app market in India. India is seeing a major rise in the time spent by people on retail and banking apps. Time spent on video streaming has also risen manifold in the recent years. 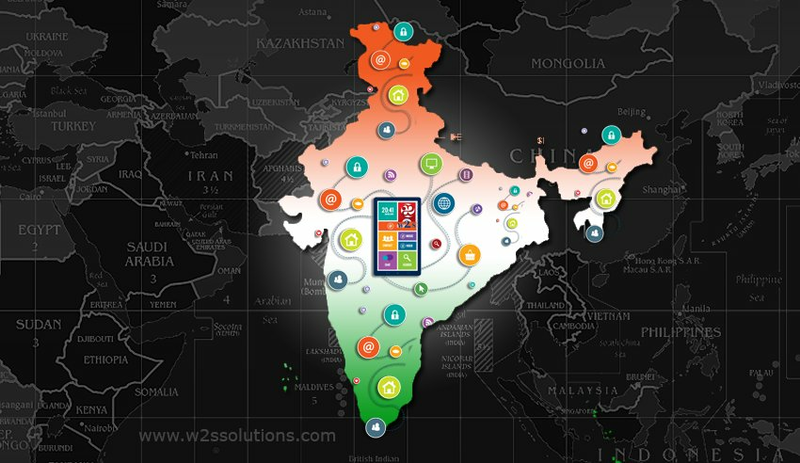 What Makes India the Most Popular Destination for Mobile App Development? Best mobile app development pricing: One reason why India is considered the best outsourcing destination is the efficient mobile app development offered under low pricing. Modern tools and experienced developers: Mobile app development throws several challenges; the Mobile App Development Companies in India have acquired the necessary skill and experience through serving clients from all over the world. Short development time: By outsourcing your mobile app development requirements to India, you may rest assured that you will be provided with a definite deadline for completion of the app development. Real-time update and prompt delivery are the specialties here. Improved user experience: Mobile app development process calls for the best possible user experience. Mobile app development companies in India assure that one of the deciding factors about your app’s success, user experience, is guaranteed. Cutting-edge technology: Mobile app development is an ever evolving field. Newer technologies are being invented regularly, necessitating developers to stay connected and be updated with all changes and technologies. State-of-the-art technology and innovative processes are warranted here. Multi-platform compatibility: Mobile app developers in India have the caliber to develop seamless apps compatible to different platforms such as iOS, Android, and Windows. With just a few nations ahead, India is sure to achieve being the top-rated mobile app development market in the world soon – both in terms of revenue generation and technical excellence! Looking for a top-notch app development company in India? Reach us for any queries or any app Development needs.